ANGRY! 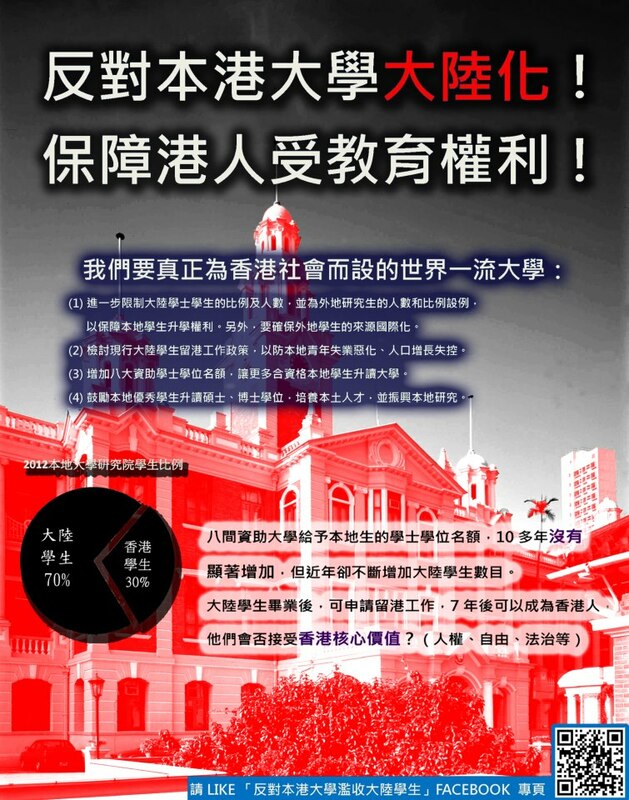 70% of Students in HK’s Universities are Mainland Chinese!!! I do not suppose anyone would disagree that universities in Hong Kong should give priority to Hong Kong students. In Hong Kong, the number of students from China has been growing while the number of spaces for the local Hong Kong students has been stagnant. Bear in mind the fact that these universities are partly funded by the Hong Kong SAR government, which means tax payers in Hong Kong are funding foreign students. The latest statistics show that an alarming 70% of the postgraduate students in the universities in Hong Kong are Chinese from Mainland China. These universities explain that recruiting foreign students is a way to internationalise their schools. However, the so called “internationalisation” is misleading! A truly internationlised university should have students from all over the world, which is what universities in Hong Kong used to be, but not from ONE SINGLE COUNTRY. One thing I want to say is if these students from China despise their host universities and their host country (Hong Kong) and if China is such a wonderful place in all aspects, why did they CHOOSE to come to Hong Kong to study? Why did they CHOOSE to work in Hong Kong after they graduated? All they want is the Hong Kong identity cards or use Hong Kong as a platform for them to immigrate to other countries! There have been numerous cases that clearly shows these universities favours students from China. The banners they put up in the campuses are in Simplified Chinese instead of the official written language – Traditional Chinese. Announcements are written with China terminologies. There’s a case recently reported by the press which was extremely controversial (also shows how ungrateful those Chinese students could be, CY Leung helped him to get his degree, and he turned around and said CY Leung would unlikely to uphold justice during his tenure as Hong Kong SAR’s Chief Executive). Another thought: The world is getting really confused about how to differentiate between Hong Kongers and Chinese, sometimes they mixed Taiwanese up with Chinese as well! I can honestly say, this would insult the genuine Taiwanese and Hong Kongers who have their national pride. 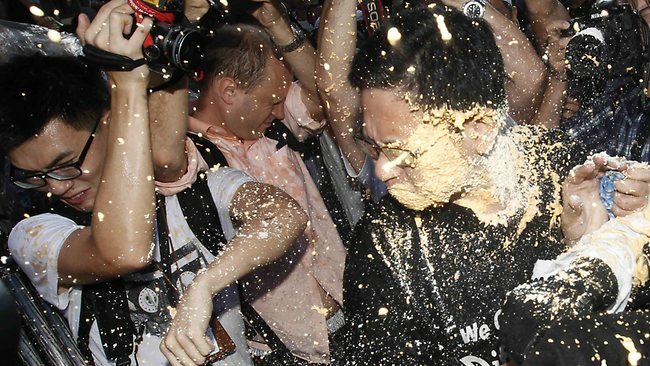 The China government is wasting no time in “conquering” Hong Kong! After live ammunition military exercise in Hong Kong, they want to build military facilities in our land too! 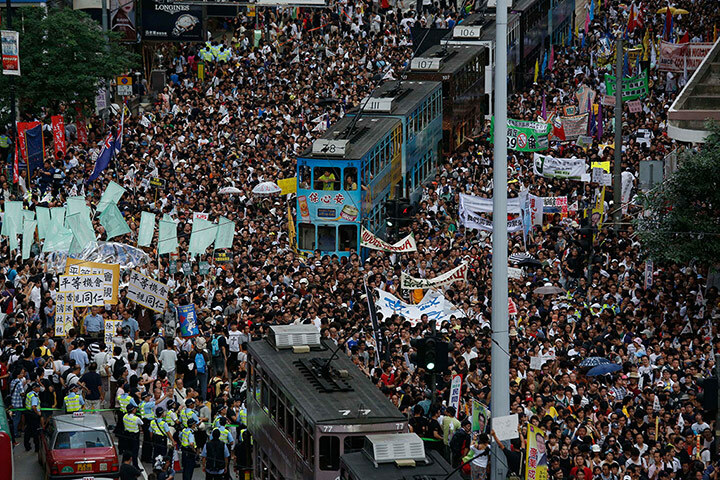 If it wasn’t for a small hand full of less biased media in HK, this would have gone without anybody noticing!